Originally surrounded by a large scalloped shell, a woman's head decorates this broken antefix or architectural decoration. The woman wears a diadem, earrings, a necklace, and a patterned dress. An artisan added bright paint to the molded terracotta head to emphasize the antefix's effect and visibility. 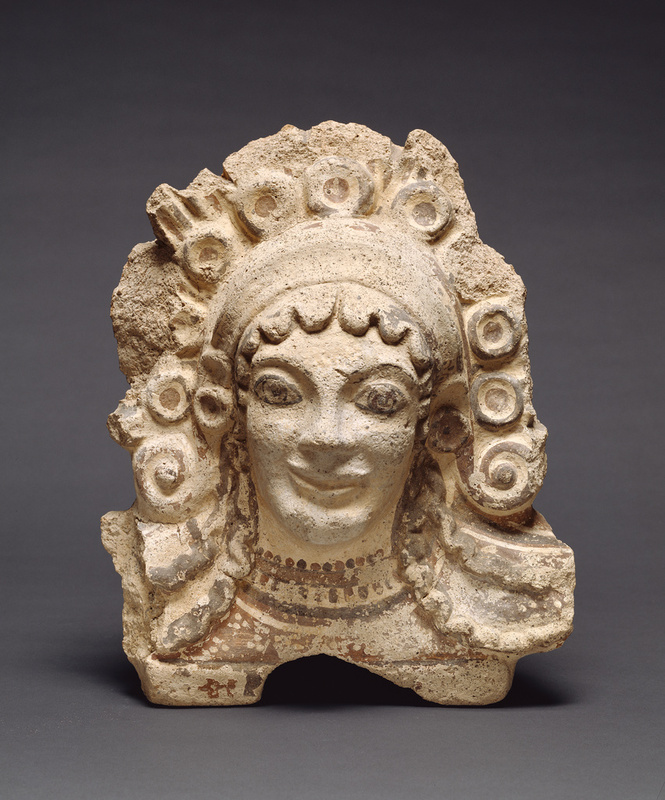 Although this antefix is unusual because it is a bust of a figure, not just a head, the Getty Museum owns another antefix made from the same mold. Antefixes very similar to this example were found at Caere. The roof tiles running along the eaves of ancient Greek and Etruscan buildings often ended in upright members called antefixes. These mold-made terracottas often took the form of heads, either of humans or mythological creatures. As well as being decorative, architectural terracottas served to cover and protect exposed wooden parts of the architecture from the elements. Leon Lévy, 1926 - 2003 (New York, New York), donated to the J. Paul Getty Museum, 1983. Del Chiaro, Mario A. "Two Fragmentary Etruscan Terracotta Panels." The J. Paul Getty Museum Journal, vol. 12 (1984), pp. 119-122, the discussuion and illustration (pp. 121-22, fig. 3) wrongly cite this object; the actual object is .3. "Acquisitions/1983." The J. Paul Getty Museum Journal 12 (1984), p. 255, no. 135. Wohl, Birgitta Lindros. "Three Female Head Antefixes from Etruria." The J. Paul Getty Museum Journal 12 (1984), pp. 111-118, the discussion and illustration (pp. 112-16, fig. 3a-b) wrongly cite this object; the actual object is .6. Cristofani, Mauro. "Nuovi dati per la storia urbana di Caere." Bollettino d'Arte (January-April 1986), pp. 1-24, p. 20, no. 5. Guidi, G. F., V. Bellelli, and G. Trojsi. Il Guerriero di Ceri. Tecnologie per far rivivere e interpretare un capolavoro della pittura etrusca su terracotta. (Rome: Ente per le Nuove Tecnologie, l'Energia e l'Ambiente, 2006), pp. 16, 37, 39, where wrongly cited as this object; actual object discussed and illustrated is .3.